Introduced in October alongside the 36-Mpix A7R, this SLR-style mirrorless model with its 24-Mpix full-frame sensor has been eclipsed somewhat by the promise of more highly detailed files from its sibling. However, at around $600 less, the short register and the less demanding 24-Mpix sensor of the A7 sounds promising for those wishing to use legacy SLR and old rangefinder lenses with the camera. Apart from pixel count the A7 sensor differs in one other important aspect. It has a number of pixels dedicated to phase detection AF, allowing faster autofocus than A7R with the new native full-frame FE and earlier APS-C E-mount lenses. However both A7 and A7R should be evenly matched when using firm’s A-mount SLT lenses with the new optionally available LA-EA4 mount adaptor. Although those earlier lenses were designed for phase-detection AF, the new mount adaptor has the SLT technology and PD-AF system already built-in. 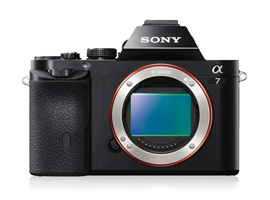 Despite the differences in the sensor the A7 and A7R are otherwise very similar. It shares the same small, dust and moisture resistant magnesium alloy body and highly detailed XGA OLED viewfinder with focus peaking. Other notable features include a tiltable 3.0-inch high-resolution rear LCD, sensitivity running from ISO100-25,600 and a 5fps burst mode. The A7 also supports both PAL and NTSC movie recording with AVCHD 1920x1080p clips at 60/50/25/24 fps. Filmmakers will also appreciate audio monitoring and the option of a ‘clean’ HDMI output for external recorders. Removing the mirror has resulted in the A7 (and A7R) being one of the smallest, most portable full frame 35mm models available. It measures 126.9 x 94.4 x 48.2 mm and weighs 474g (16.7 oz ) without lens. The Sony A7 is shipping now at $1,699 body only, or for $1,999 with FE 28-70mm f3.5-5.6 OSS zoom. 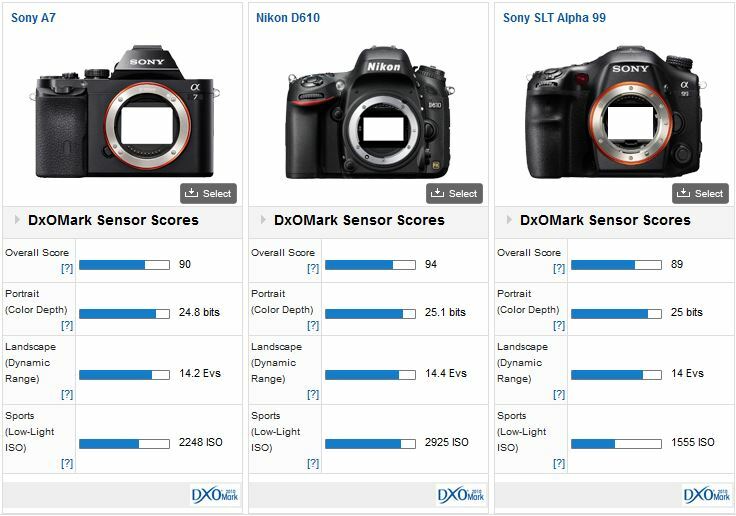 The Sony A7 achieves a DxOMark score of 90 points and is ranked in 9th place overall just behind the medium format Phase One IQ180 at 91 points and just above the full-frame Nikon D4, which scored 89 points. 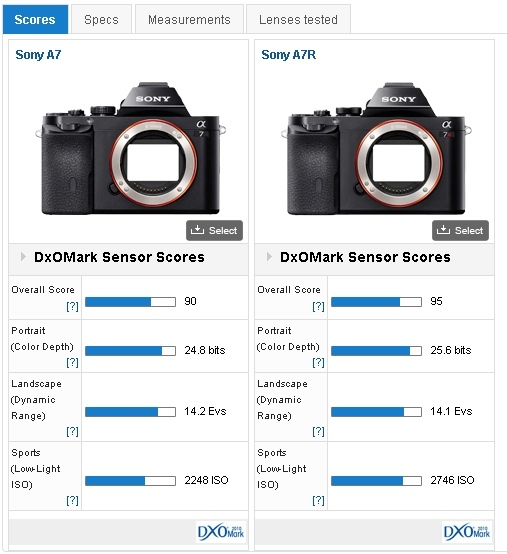 Compared against the pricier 36-Mpix Sony A7R model, with its DxOMark score of 95 points, the A7 has -0.5 stop less color depth, 0.2 stop less exposure or dynamic range and around -0.3 stop less low light performance. Sony has been increasingly innovative in the last 12 months with the outstanding Cyber-shot DSC-RX1R vying for market share in the compact professional class, alongside other full-frame models such as the unique Leica M (Typ 240) rangefinder. 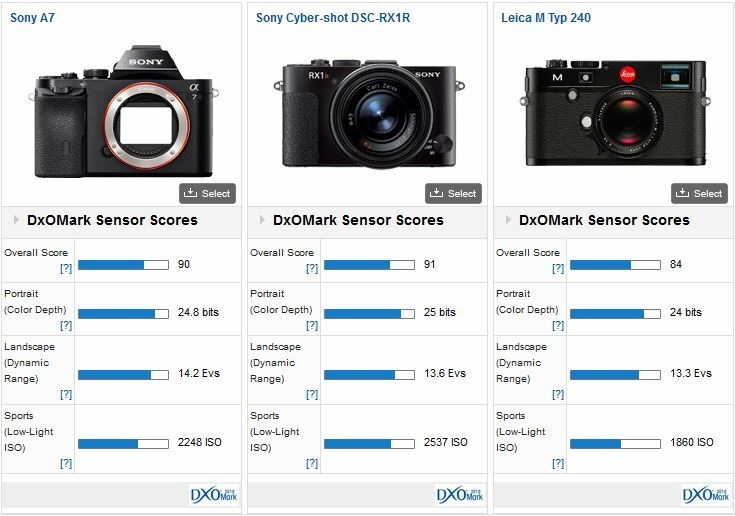 Unsurprisingly with a similar 24-Mpix sensor (albeit without AA filter) the DSC-RX1R performs much the same as the A7 though there are some slight though negligible differences in real terms in color precision and low light performance. As for dynamic range the A7 has an extra +0.6 Ev over the RX1R and +0.9 Ev over the European sourced 24-Mpix sensor in the Leica. The A7 also has a +1/3 stop extra color depth at base sensitivity and the same +1/3 stop advantage over the Leica in low light though in real terms it’s insignificant. Unsurprisingly perhaps, compared with the Nikon D610 and the firm’s SLT A99, both using a similar full-frame 24-Mpix CMOS sensor, the results are very close. Color depth between the three is similar and the A7 sits between the two with regard to the dynamic range, just +0.2 Ev separates the Nikon. However, it’s the low light performance that divides the two Sony models. While the A7 has a + ½ stop advantage over the SLT-based A99, the Nikon has a +1/3 stop over the A7, presumably on account of the latter model’s modified sensor. 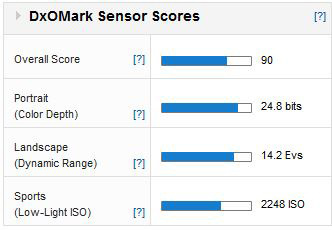 With only a very small hit on sensor performance, the A7 compares very well against the Nikon D610 and has a very competitive performance against firm’s A99 and RX1 models. It also compares favorably with the Leica M. That said, the A7 is unlikely to match the output from that model’s sensor with its offset micro-lenses and built-in profile corrections, at least with wide-angle lenses. When used with the native lenses the A7 promises excellent image quality, and at the price it’s a very tempting proposition.